Nestled at the foot of a mountain and facing an expansive loch on the exquisite Isle of Skye sits Kinloch Lodge. Once the hunting lodge for nearby Armadale Castle, the 17th century building remains in the possession of Lord and Lady Macdonald, who have seen fit to convert it into a cosy 14-guestroom boutique hotel. Whilst the wee venue holds many charms, what lured Sated here on a typically tempest-driven evening was the restaurant, run by the Michelin-star, Roux-trained, Brazilian-Scottish chef, Marcello Tully. We are greeted by the amiable Tim, who leads us to a large Drawing Room, furnished with tartan upholstery and antique wooden tables, set against a backdrop of faux oil paintings and large windows which frame the views over sea-loch Na Dal. He takes our drink orders and leaves us with a choice of two Tasting Menus (five and seven-courses). Not wanting to pass on the option of more desserts, we elect to sample the longer menu. 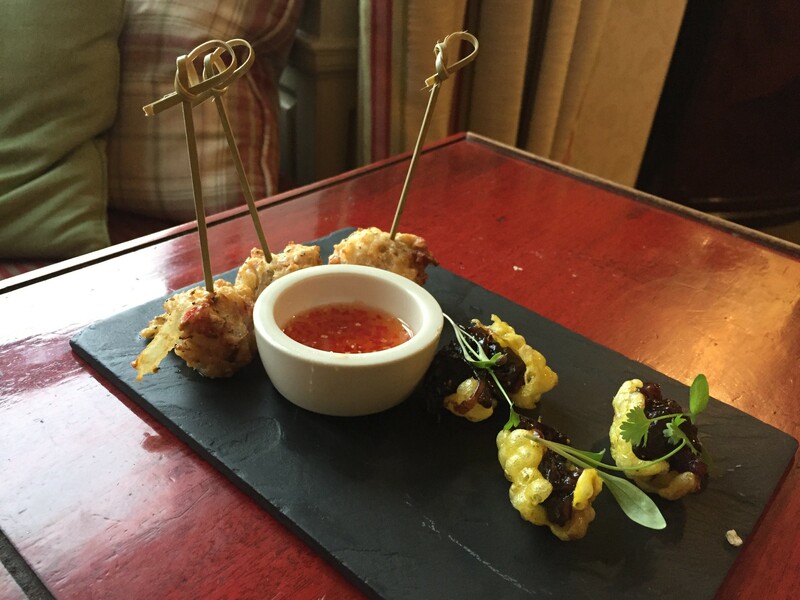 Tim returns with our Loch Ness gin and tonics, served with grapefruit garnish, and a slate of canapés, comprised of Saffron crisps topped with fig relish, and Chicken and Parma ham bhajis. The Eastern influence takes us somewhat by surprise but the morsels are a pleasant appetiser. The fig is beautifully flavoursome with a hint of spice peeking through the sweetness. The saffron crisp is a bit stale but the bhaji is laudably light with minimally oily residue. Once we have suitably relaxed into the start of our evening, we are brought through to the bustling, wood panelled dining room, in keeping with the rest of the hotel’s décor. The first plate placed before us is a slightly Curried Panna Cotta topped with Spiced Chorizo and Raisins, and paired with a palate cleansing glass of Champagne. The curry element appears gentle against the overpowering flavour the chorizo, combining beautifully with the creamy texture of the panna cotta and the sweetness of the raisins to deliver an exciting and innovative dish. Next up is the Celery & Strathdon Blue Soupçon, served with homemade pistachio and apricot bread, and a choice of lightly salted or coriander chili butter. The soup has been aerated to lighten up what would have usually been very rich and viscous, allowing it to maintain an element of grace and keep us from filling up too quickly. The temperature has been stepped up a touch from the cold first starter, slowly preparing our palates for the mains. As we dip our spoons into the small soup cups, we discover secrets in the form of raisins and pieces of nuts, which add not only malt and sweetness that combat the saltiness of the cheese, but also a variety of textures that complete the dish and leave us rather excited for what’s to come. Sadly however, the three mains do not quite live up to the promise of the early courses. All are comprised of exquisite ingredients, perfectly cooked and with intriguing components, yet each is overcomplicated. The Morey Pork Cheek is soft and juicy and is set alongside gorgeously plump local scallops in a Michelin Surf n’ Turf ensemble. Pickled fennel lends itself beautifully to both, however an “Oriental Sauce” is a jarring and overly sweet addition, combining what appears to be black bean, hoisin and pineapple. The next dish continues the “Asian” theme that seems to have assimilated itself into the menu, but introduces an additional international visitor. Monkfish is wrapped in Parma ham and topped with an incredibly sweet Brazilian-inspired Caipirinha gel. This in turn rests on a wonderfully flaky fillet of seabass, afloat in a sea of creamy coconut and lime sauce. Whilst all the flavours are spectacular on their own, together they are somewhat baffling. The saving grace is the delectable pairing of the 2013 Mâcon-Solutré whose lightly bitter citric notes cut through the richness and sweetness of the course at first sip, but which is then changed by the dish’s flavours to become creamier and buttery. The last main features a quail parcel stuffed with vegetable and Perthshire honey mousse, also wrapped in pork – this time pancetta – accompanied by a smear of spinach purée, potatoes, mushrooms, and an overwhelming passion fruit sauce. Much like the previous two dishes, the presentation is on point and the local ingredients of phenomenal quality, but the finished product is just too complicated. Before the parade of desserts begin, we are presented with a chilled glass of Eradus “Sticky Mickey” Late Harvest Sauvignon Blanc. Whilst hypersweet, the burnt caramel, orange and prune notes perfectly prepare our palates for the Tain Morangie Brie with Prune and Orange Mousse. Despite being dressed in another overly sweet fruit sauce, the dish is a triumph. A gorgeous prune and orange fruit paste recalls fruit leather or Christmas pudding, balancing well against the delicate flavour of the brie. Poached pear slices are soft and graceful and little wobbles of orange jelly add a fun freshness. The next dish, a Chocolate & Basil Espuma with Raspberry Sauce is equally exciting and enjoyable, with one of our party nostalgically commenting that “it tastes like a Wagon Wheel”. Derogatory though this may at first seem, there is definitely something to be said for inspiring sentimentality and child-like joy in a dessert! As we work our way through it, the grown-up coupling of chocolate and basil lying within the foam is overcome by the jammy raspberry that hides at the bottom of the bowl, but the dish succeeds in perking us up as we move towards our last course – and what a finale it is! 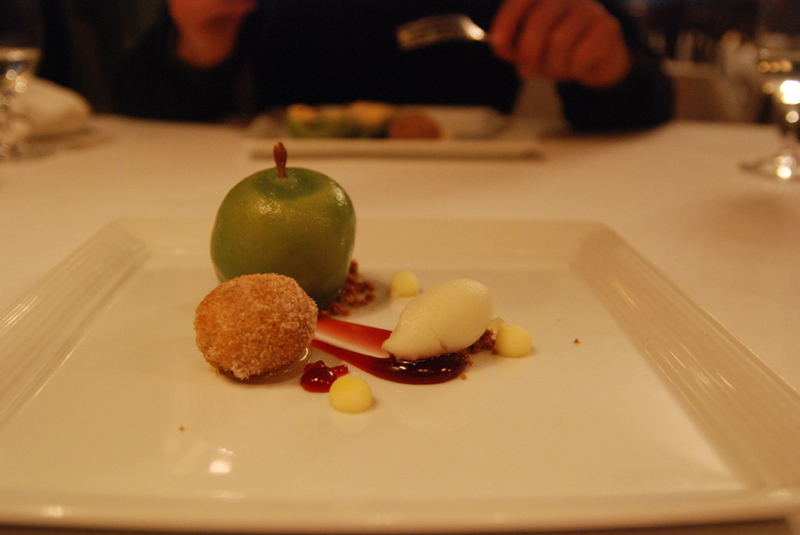 The “Apple Crumble” Parfait with Blackcurrant Gel, Apple Sorbet and Cinnamon Doughnut is a site to behold. A round of parfait is dressed to resemble a green apple and sits atop a smear of gel. The doughnut is warm, providing a contrast to the frozen elements, whilst crisp discs of apple add a crunch, enlivening the textural play. As our empty plates are cleared away, we feel a little unsure about whether we would class the experience was a success or not. The ingredients, presentation and hospitality were all faultless but nearly half the dishes that we were presented with overstimulated and confused our palates. On top of this, we left our table feeling like we could have eaten and drank considerably more. Whilst an intriguing and stimulating meal in many respects, our conclusion was that for £90 a head (£150 with a wine flight), we wanted a greater refinement of flavours and a little more of that tasting menu panache and sense of occasion.